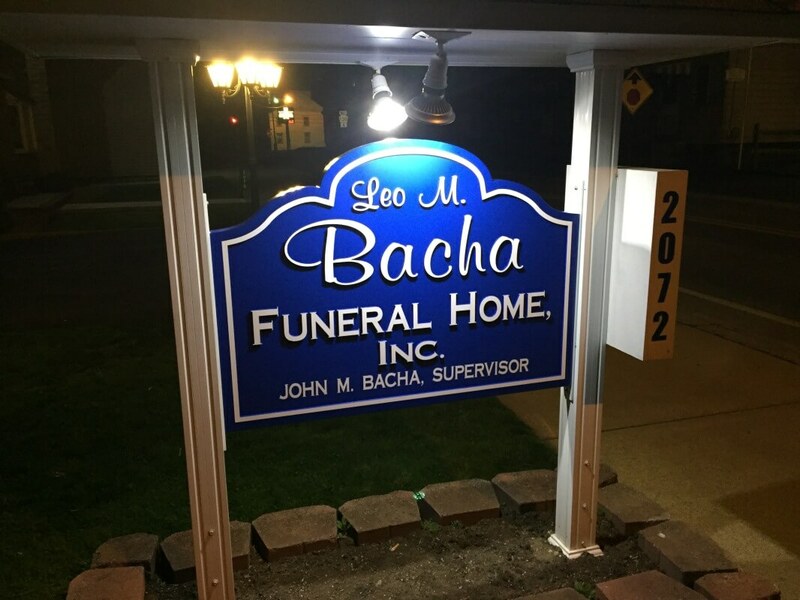 The Leo M. Bacha Funeral Home, Inc. located at 2072 Route 130 in Pleasant Unity, Unity Township, is capable of handling large services or multiple services at the same time. Two parking lots behind the funeral home as well as another across the street provide plenty of off street parking for families and visitors. This facility operated by the Bacha Family since 1993 is centrally located between Greensburg, Latrobe and Mount Pleasant along Route 130 (also Route 981), is a quick drive from Route 30 and just 4 miles south of the Arnold Palmer Regional Airport. FOLLOW THE PA TURNPIKE EAST TO EXIT 67 WHICH IS THE IRWIN – NORTH HUNTINGDON TOWNSHIP EXIT. AFTER TOLL BOOTHS KEEP RIGHT TO FOLLOW ROUTE 30 EAST 6 MILES TO THE GREENSBURG AREA WHERE ROUTE 30 WILL TURN INTO A BYPASS AROUND GREENSBURG WITH EXIT RAMPS. CONTINUE EAST ON ROUTE 30 AROUND GREENSBURG ANOTHER 4 MILES TO THE 6TH EXIT MARKED “ROUTE 130 PLEASANT UNITY”. AT END OF EXIT RAMP AT TRAFFIC LIGHT TURN RIGHT ONTO ROUTE 130 EAST AND FOLLOW ROUTE 130 EAST 5 MILES TO A “T” AT A STOP SIGN IN THE VILLAGE OF HUMPHREYS. TURN LEFT AT THE “T” TO CONTINUE EAST ON ROUTE 130 AND PROCEED STRAIGHT 1 MORE MILE TO A BLINKING LIGHT AT A FOUR WAY STOP IN PLEASANT UNITY (COMMERCIAL BANK AND TRUST WILL BE ON THE CORNER). CONTINUE STRAIGHT THROUGH BLINKING LIGHT ON ROUTE 130, THE FUNERAL HOME IS THE FIFTH BUILDING ON THE RIGHT. THERE IS PARKING EITHER BEHIND THE FUNERAL HOME OR DIRECTLY ACROSS THE STREET. FOLLOW INTERSTATE 70 EAST TO NEW STANTON. AT NEW STANTON CONTINUE STRAIGHT TO FOLLOW ROUTE 119 NORTH 5 MILES TO GREENSBURG. TURN LEFT ONTO ROUTE 30 EAST. FOLLOW ROUTE 30 EAST TO THE 3RD EXIT MARKED “ROUTE 130 PLEASANT UNITY”. FOLLOW ROUTE 119 NORTH TO THE ROUTE 31 MT. PLEASANT EXIT. TURN RIGHT ONTO ROUTE 31 EAST INTO DOWNTOWN MT. PLEASANT. TURN LEFT ONTO CHURCH STREET WHICH IS ALSO ROUTE 981 NORTH. CONTINUE ON ROUTE 981 NORTH 10 MILES TO A BLINKING LIGHT AT A FOUR WAY STOP IN PLEASANT UNITY (COMMERCIAL BANK AND TRUST WILL BE ON THE CORNER. TURN RIGHT AT THE BLINKING LIGHT ONTO ROUTE 130 EAST (ALSO ROUTE 981 NORTH) AND THE FUNERAL HOME IS THE FIFTH BUILDING ON THE RIGHT. FOLLOW THE PA TURNPIKE (INTERSTATE 76) WEST TO EXIT 91, DONEGAL. AFTER GOING THROUGH THE TOLL BOOTHS TURN LEFT ONTO ROUTE 31 EAST. PROCEED ONLY 500 YARDS AND TURN LEFT TO FOLLOW ROUTE 711 NORTH 5 MILES TO VILLAGE OF STAHLSTOWN. AT STAHLSTOWN TURN LEFT ONTO ROUTE 130 WEST WHICH IS A RURAL 2 LANE ROAD THAT WILL TAKE YOU ACROSS THE CHESTNUT RIDGE. FOLLOW ROUTE 130 10 MILES TO A STOP SIGN IN PLEASANT UNITY. CONTINUE STRAIGHT THROUGH THE STOP SIGN TO CONTINUE ON ROUTE 130 UP A STEEP HILL. AFTER YOU REACH THE TOP OF THE HILL AND GO AROUND A BEND YOU WILL SEE A BLINKING LIGHT AT A FOUR WAY STOP AHEAD OF YOU, THE FUNERAL HOME IS FIVE BUILDINGS BEFORE THE BLINKING LIGHT ON THE LEFT. FOLLOW ROUTE 30 WEST TO ROUTE 981 IN THE LATROBE AREA AT THE ARNOLD PALMER REGIONAL AIRPORT. TURN LEFT AT THE AIRPORT ONTO ROUTE 981 SOUTH. GO ONE MILE ON ROUTE 981 SOUTH ALONG AIRPORT TO A FOUR WAY STOP SIGN THEN TURN RIGHT TO CONTINUE ON ROUTE 981 SOUTH. FOLLOW ROUTE 981 SOUTH AN ADDITIONAL 4.5 MILES TO A STOP SIGN AT THE INTERSECTION OF ROUTE 981 AND ROUTE 130 IN PLEASANT UNITY. KEEP TO THE RIGHT AT THE STOP SIGN TO FOLLOW ROUTE 130 WEST (ALSO ROUTE 981 SOUTH) UP A STEEP HILL. FOLLOW ROUTE 22 WEST TO BLAIRSVILLE. IN BLAIRSVILLE FOLLOW ROUTE 217 SOUTH APPROXIMATELY 12 MILES THROUGH DERRY BOROUGH TO ROUTE 30. TURN RIGHT TO FOLLOW ROUTE 30 WEST APPROXIMATELY 3 MILES TO ROUTE 981 IN THE LATROBE AREA AT THE ARNOLD PALMER REGIONAL AIRPORT. FOLLOW ROUTE 66 SOUTH FROM ROUTE 22 WHICH TURNS INTO THE PA TURNPIKE TOLL ROUTE 66 SOUTH ALSO KNOWN AS THE AMOS HUTCHINSON BYPASS.. NOTE: THIS IS A TOLL ROAD WHICH WILL REQUIRE 75 CENTS EXACT CHANGE OR EASY PASS TO EXIT. TAKE THE FOURTH EXIT MARKED ROUTE 30 GREENSBURG. AFTER GOING THROUGH TOLL BOOTH TURN LEFT ONTO ROUTE 30 EAST. FOLLOW ROUTE 30 EAST APPROXIMATELY ONE MILE TO THE GREENSBURG AREA WHERE ROUTE 30 WILL TURN INTO A BYPASS AROUND GREENSBURG WITH EXIT RAMPS. CONTINUE EAST ON ROUTE 30 AROUND GREENSBURG 4 MILES TO THE 6TH EXIT MARKED “ROUTE 130 PLEASANT UNITY”. FOLLOW ROUTE 30 EAST PAST WESTMORELAND MALL TOWARD LATROBE. AT THE FOURTH TRAFFIC LIGHT AFTER THE MALL WHERE MOUNTAIN VIEW INN IS LOCATED TURN RIGHT ONTO MARGUERITE ROAD. JUST 200 FEET OFF OF ROUTE 30 THERE IS A “Y” IN THE ROAD – YOU MUST KEEP TO THE LEFT TO REMAIN ON MARGUERITE ROAD. FOLLOW MARGUERITE ROAD APPROXIMATELY 4.5 MILES TO A BLINKING LIGHT AT A FOUR WAY STOP IN PLEASANT UNITY (COMMERCIAL BANK AND TRUST WILL BE ON THE CORNER). TURN LEFT AT THE BLINKING LIGHT ONTO ROUTE 130 EAST AND THE FUNERAL HOME IS THE FIFTH BUILDING ON THE RIGHT. AN ALTERNATE ROUTE FROM GREENSBURG WOULD BE TO FOLLOW ROUTE 130 EAST FROM ROUTE 30 EXACTLY 6 MILES TO THE BLINKING LIGHT AND CONTINUE STRAIGHT THROUGH TO THE FIFTH BUILDING ON THE RIGHT.